At the beginning of my 500 Days Of Film Challenge, I made a list of all of the places I could source the films that I wanted to watch. (I wrote a blog about it here: Top 10 Ways To Watch Movies At Home). Netflix was, of course, on this list. However, back then, I was skeptical - I wasn't sure that Netflix was going to be much help in my film challenge. It just didn't appear to offer the films that I wanted to watch. I was even tempted to cancel my subscription. Almost a year on and and how things have changed. I have now seen some wonderful films thanks to Netflix (documentaries in particular). Many of these movies are well known but some were hidden movie gems for me. As there is nothing worse than endlessly scrolling to try to find a film, here are 40 movies that you may have missed on Netflix. The Gist: Kate and Geoff Mercer are about to celebrate their 45th wedding anniversary. The venue has been booked and only a few details remain left to organise. Then a letter arrives informing Geoff that the body of Katya, his girlfriend of 50 years ago, has been discovered - perfectly preserved - in the Swiss mountains. At first bemused, then unsettled, Kate starts to wonder just how well she knows her husband. 45 Years is a wonderfully observed, unsettling and deeply moving film. The Gist: A wonderfully funny and poignant film about small town life, Junebug netted Amy Adams her first Oscar nomination. Art dealer and gallery owner, Madeleine (Davidtz), meets and marries successful Carolinian George Johnsten. The couple combine a business trip with a visit with his family. Junebug is a film that film Roger Ebert loved (he called it a movie that "understands, profoundly and with love and sadness, the world of small towns") and is definitely worth checking out. The Gist: Alice (an Oscar winning performance from Julianne Moore) is a highly respected linguistics professor. Happily married to John (Alec Baldwin) with three grown children, she thrives on her work. Everything changes, however, when Alice is diagnosed with early onset Alzheimer’s Disease. This, of course, is a disease for which there is no cure. A disease that will slowly strip Alice of everything that she holds dear. Still Alice is not an easy film to watch. However, I am very glad that I did. The performances are wonderful (Kristen Stewart is particularly good) and the subject matter is so important. The Gist: Stuck in a dull job and still living with his parents, Jon (Domhnall Gleeson) is desperate for change. He wants to be a songwriter and musician but can’t seem to create anything original. When Jon joins an avant-garde pop band (led by Michael Fassbender's enigmatic Frank, who hides his face behind a huge fake head), he believes that he is finally about to make it big. However, Jon soon finds that he is way out of his depth. Frank is a wonderful, poignant and offbeat comedy (with many laugh out loud moments) and I absolutely loved it! The Gist: It's the end of the 19th century and 16 year old Jay Cavendish (Kodi Smit-McPhee) is in love. However, the object of his affection, Rose (Caren Pistorius), is on the run - following an accident that Jay believes is all his fault. Jay journeys across the American frontier to find his lost love - unaware that he is being pursued by a band of dangerous outlaws. He is soon joined by Silas (Michael Fassbender) - a man who agrees to be his guide but who has sinister motivations of his own. The Gist: Winter’s Bone tells the story of 17 year-old Rae (Jennifer Lawrence) who, determined to protect her family and her home, embarks on a dangerous mission to find her missing father - dead or alive) in the hostile environment of Missouri's Ozark Woods. This is a gripping, gritty drama with a stunning performance from Jennifer Lawrence. The Gist: J.C. Chandor's film examines what it must have been like to work for a large investment bank on the eve of the global financial crisis. Margin Call is a gripping and tense drama and features an impressive cast, all of whom give powerful performances. The Gist: In the early hours of 1 January 2009, Oscar Grant made his way home after celebrating the New Year with his girlfriend and friends in San Francisco. However, a fight on a packed train led to the arrival of the police. Grant and his friends were detained on the platform of Fruitvale Station. Minutes later, Grant was shot in the back by Bay Area Rapid Transit policeman, Johannes Mehserle. He later died in hospital. Oscar Grant was only 22 years old. Fruitvale Station is a gripping and extremely moving depiction of a tragic true story. The Gist: Beasts Of No Nation is an extremely tough drama and is not for the fainthearted. This is not a film that you necessarily 'enjoy' but it is a truly remarkable movie about a subject that needs our attention. When civil war tears his family apart, a young West African boy called Agu (the brilliant Abraham Attah) is left alone in a dangerous land. He stumbles upon and is then is forced to join a unit of mercenary fighters. This group is led by a ruthless commandant (superbly portrayed by Idris Elba). The unit trains Agu and transforms him into a child soldier. The Gist: Grace (Brie Larson) is a supervisor at a group home for vulnerable children and she is good at her job. She is firm but fair, in control but not controlling, professional yet approachable. However, the arrival of self-harming teen, Jayden, forces Grace to confront her own troubled past. Short Term 12 is a wonderful film, thought provoking film full of gorgeous performances. The Gist: Married couple, Kate and Charlie, enjoy going out for drinks. However, when Kate is sick at work (a result of a terrible hangover) she knows that something has to change. Too many bad things have happened to her whilst drunk and her life is spiraling out of control. Kate joins AA, determined to remain sober. This decision also forces her to reassess her marriage - can it survive her new found sobriety? The Gist: Another tough watch but so worth while for Ramsay's brilliant adaptation of Lionel Shriver's novel. Tilda Swinton gives powerful performance as free spirited Eva. Once married, she starts to feel trapped - a feeling that only intensifies when she gives birth to a son, Kevin. Kevin is a challenging and increasingly disturbed boy who resists Eva at every turn. He pushes her to the limits of her patience - and beyond. Was Kevin born evil? Or is Eva to blame for the horror that follows? The Gist: Blue Ruin is a violent, deeply suspenseful and darkly comic thriller. Dwight Evans (Macon Blair) is a mysterious, homeless outsider - living life in his car on the very margins of society. Then a piece of devastating news leads him to carry out a violent act of vengeance. Too late, he realises that he isn’t the most adept of assassins. Dwight now has to engage in a brutal fight for his own survival and that of his estranged family. The Gist: The Gift is a tense and unsettling psychological thriller. It kept me on the edge of my seat until the film's final (dark and twisty) act. Simon (Jason Bateman) and Robyn (Rebecca Hall) are a successful couple who have moved to LA to start a new life. Whilst out shopping, they meet Simon’s old school friend, Gordo (Joel Edgerton). However, there is something off about Gordo. For a start, he keeps turning up at their house - often leaving unsettling gifts. The Gist: I include The Guest in this list not because I think it is a superior thriller (it's not) but because it is an interesting take on the home invasion genre. Two powerful performances from Dan Stevens and Maika Monroe also make it worth a watch. The Guest doesn't fulfill its potential and slides into utter ridiculousness but it is also quite fun. The Gist: I really enjoyed Red Hill. This taut and tense thriller/western is full of nods to other classic western movies. It stars Ryan Kwanten (True Blood) as a likeable young police officer who has to survive an extremely trying first day at work. The Gist: Not a film to watch if you suffer from claustrophobia, Buried is the story of Paul Conroy (Reynolds) who wakes up to find that he has been buried alive inside a coffin. With only a lighter and a mobile telephone, he has to coordinate his rescue. But time is running out. Buried stands out because Cortés stays with Conroy for the entire length of the film. We are also trapped in that coffin - we only know what Conroy knows, see what he sees. It is tense and so claustrophobic. The Gist: After loving 10 Cloverfield Lane, I recently re-watched Cloverfield on Netflix. Despite its narrative flaws and the fact that I am so over found footage, I enjoyed this effective Sci Fi thriller about a group of friends and their struggle to survive a devastating monster attack in New York. The Gist: Oh my goodness, I love this movie. It is full of wonderful, Spielbergian nostalgia and I just have to watch it at least every couple of months. The story takes place in a small town in Ohio where a group of friends decide to make a Super 8 zombie movie. One night, while shooting their film, they witness a catastrophic event. Realising this was no accident and that their lives are now in danger, the friends decide to investigate just what is going on. The Gist: Having seen and loved Gareth Evans' The Raid, I was a little nervous before I watched The Raid 2. How could this sequel possibly be as good as the original? I needn't have worried. The Raid 2 is a tense film with a gripping story and simply stunning fight sequences. Brilliant. The Gist: Haywire is an enjoyable action film with an impressive cast. It features the awesome Gina Carano as ex-marine, Mallory Kane - a highly skilled operative working for a government security contractor. After rescuing a Chinese hostage, she realises that she has been double crossed. The Gist: I love Mark Whalberg in The Fighter. His is a quiet and restrained performance but no less powerful for that. Based on the true story of boxer, Micky Ward (Wahlberg), the film also stars Christian Bale as Micky's brother, Dicky. Once hailed ‘The Pride Of Lowell” (after his 1978 fight with Sugar Ray Leonard) Dicky is now struggling with a crack addiction. Micky is torn between family loyalty and his aspirations as a boxer. The Gist: If you are looking for a feel good mixed martial arts film, then look no further than Warrior. When his emotionally damaged son Tommy (Tom Hardy) returns home, recovering alcoholic Paddy Conlon (Nick Nolte) hopes for a reunion. However, Tommy only wants his father to help him train for Sparta, a major mixed martial arts tournament. Meanwhile, Paddy's other estranged son, Brendan (Joel Edgerton), is in financial trouble and wants to compete for Sparta's prize money. The stage is thus set for some major cage fighting action. The Gist: Kate Winslett stars as Adele, a depressed, borderline agoraphobic single mother. Along with her son, Adele is taken hostage by wanted man, Frank (Brolin). Holed up in her house, Adele and Frank fall in love and the three form an unlikely family. The Gist: Like Crazy is a sweet film about the promise of love. It is also a film that is not afraid to examine the reality of relationships. Anna (Jones) meets Jacob (Yelchin) at college in Los Angeles. The two start a relationship and are soon inseparable. However, Anna’s visa is due to expire and she will have to return to England. The two cannot stand the idea of being apart and so Anna decides to overstay. This decision will have a major impact on both of their lives. The Gist: I Am Love is a wonderful romantic drama that sees Swinton as Emma, wife and mother to a wealthy family based in Milan. She lives to serve her husband and three children - making sure everything in the household runs perfectly. However, a revelation from her daughter and a chance meeting with her son’s friend changes everything in Emma’s life. She starts to explore her own desires - with tragic results. The Gist: Testament Of Youth tells the moving, true story of Vera Brittain (Vikander) whose dreams of an Oxford education are devastated by the outbreak of World War One. After her brother and finance (Harington) join the front line, Vera volunteers as a nurse. Nothing could prepare her for the tragedies to follow. At the end of the war, Vera writes a memoir - one of the few books to detail a woman’s experience of World War One. The Gist: The Babadook is a really effective horror from Australian director, Jennifer Kent. Following the tragic death of her husband, Amelia (Davies) is a left to bring up her extremely demanding son, Samuel (Wiseman). She is absolutely exhausted as, plagued by nightmares, Samuel keeps her awake - every night. Stretched to breaking point, she still makes time to read to Samuel every night. One night, they find a new pop up book called The Babadook. Amelia only realises just how dark and scary the story is midway through. By then, however, it is too late. The Gist: Author, Maddie (Siegel), moves to a remote cabin in the woods (oh yes) in order to write her new book. All is going well until, one night, a masked psychopath appears at her window. So far so generic right? Well, don't write this film off yet. It is actually really effective. For a start, Maddie is deaf, which leads to several scary, he's behind you moments. And, secondly, she's not going down without a fight. The Gist: I just love this New Zealand horror/comedy. I recently watched it for the second time and enjoyed it even more. It is laugh out loud funny while also containing more than a few jump scares. Delinquent, Kylie Bucknell (Morgana O'Reilly), is placed on home detention and forced to live with her mother, Miriam. Miriam thinks that their home is haunted and Kylie starts to wonder if she is right. The Gist: Another movie gem from New Zealand, this horror/comedy/mocumentary follows a group of vampires who share a house together. We see their everyday, mundane routines (housework rotas and the like) and they talk frankly about the challenges of being undead. 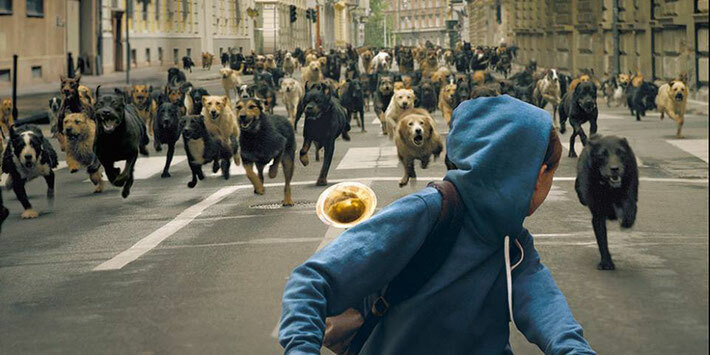 The Gist: As a dog lover, I had to psych myself up to watch White God. However, while some scenes are really tough to watch, I really enjoyed this horror/thriller. It is gripping, the dogs are fantastic and there are some darkly comic moments. When 13 year old Lili moves in with her father, he insists that her dog, Hagen, goes to an animal shelter. When she refuses, he abandons the pooch on the street. Both Lili and Hagen are left devastated and their lives spiral downwards. Hagen is beaten and abused before he makes his escape and, along with hundreds of other dogs, seeks vengeance. The Gist: I really didn't expect to love Troll Hunter as much as I did. Yes, this is another found footage horror, but it is one of the few truly effective examples of this genre. Film footage has been discovered in Norway featuring a group of college students and their recorded interactions with a troll hunter. The footage has been edited and authenticated in order to piece together what happened to the students before they disappeared. Because they have not been seen since. The Gist: You might recognise their voices but you may not know their names. 20 Feet From Stardom tells the remarkable story of the unsung backup singers behind some of the greatest musical legends of the 21st century. This gripping film won the Oscar for best documentary in 2014 and it is easy to see why. The Gist: Mea Maxima Culpa: Silence In The House Of God is a disturbing and yet also inspiring documentary about child abuse within the Catholic Church. The film focuses on the first known US-based case concerning accusations of child sexual abuse by a priest. This case would spur a worldwide investigation - one that eventually reached all the way to the Vatican. The Gist: A gripping and upsetting documentary about three young men from West Memphis - Jessie Misskelley, Jr., Jason Baldwin and Damien Echols - who were wrongly convicted of the horrific murder of three young boys. West Of Memphis was inspired by Paradise Lost - a trilogy of films about the case by filmmakers Joe Berlinger and Bruce Sinofsky. Having watched these films, Peter Jackson (Lord Of The Rings) and Fran Walsh wanted to do something to help free the men. They decided to make a film - focusing on Echols’ time on Death Row and his fight to save his own life. The Gist: The Thin Blue Line is a truly remarkable documentary. It sets out to prove the innocence of Randall Adams - a man who had been found guilty of the murder of a police officer. Morris wanted to highlight the fact that Adams had not received a fair trial. This is a gripping film as Morris (who had worked as a private investigator) uncovers new evidence, pieces the story together and ends his film with a startling confession. The Gist: This powerful documentary looks at the 93 days of violent unrest that took place in Ukraine during the winter of 2013 and 2014. Afineevsky led a large crew of cameramen and filmed the revolt against Ukrainian president Viktor Yanukovych in Kiev’s Maidan Square. The footage is powerful and extremely moving. The film is also really inspiring as we see just how many people came together and risked their lives for the cause. After the end of the revolt, Afineevsky returned to Kiev to uncover the stories of those incredibly brave souls who took part. The Gist: Dreams Of A Life is a heartbreaking documentary about the life and tragic death of Joyce Vincent. Surrounded by the Christmas presents that she was wrapping, Joyce Vincent died in her bedsit in North London in 2003. She was 38 years old. Joyce's body was not discovered for three years. Her television was still on when she was finally discovered. Dreams Of A Life examines Joyce’s life by interviewing those people who knew her best and tries to understand how no one realised that she was missing. The Gist: I didn't know what to expect when I started to watch I Am Big Bird. However, only a few minutes in, I became hooked. Caroll Spinney has led an extraordinary life. He has been the puppeteer for Big Bird and Oscar The Grouch since 1969. Using video footage and interviews with Spinney's family and colleagues, I Am Big Bird tells a fascinating, poignant and ultimately inspiring story. What do you think of these Netflix gems? Are there any that you have already seen? Have I convinced you to watch something new? Have a missed something? Whatever the case, do let me know - why not leave me a comment in the box below!